Well... I'm not quite sure what happened.. I consistently logged everything, exercised every single day, ate at a reasonable deficit (didn't over do it!) and still gained weight. ok to be fair. thats not really anything. hahaha but after such a consistently good month of eating well and exercising every day.. I kinda hoped there'd be a real loss . Congrats to everyone who made their monthly goal...and congrats to those of us not yet there, but still here on Spark working on it!! We all get to take a deep breath and look at the lessons we learned this past month...! (Even where the results of those "lessons" were to remind us this isn't an easy, direct Journey from point A to B. ) We don't overlook those times when we were on the right path, and heading towards our goals either!! Oh NO! I went the wrong direction in the last 12 days! :-o !! It all started when I was frustrated with continuing lethargy and decided to do a 'gluten free' experiment. Oh my, the cravings and hunger with that. I gave up after about a week, but then went a bit overboard on bread--too much enjoying the new sourdough I've been learning to make. So...in the not even 2 pounds! Back at it again in June! May 17 -- 180.9 --3.1 down, 2.8 to go. I think this is POSSIBLE! Goal to lose 2.5 lbs. 05/23 - 198 - dwn 2 ONEDERLAND - Once again!! GOAL: 2.5 pounds. - Staying in the middle of the road. I have been logging consistently for almost 2 years! May 29th will be my Spark People 2 year anniversary! It's been up and down the same 10 lbs since I got here hahah. Basically between 106 - 116 lbs nothing tragic but I like how I look and feel at 108 or lower. So June tends to be a really good weight loss month for me. Hoping to really get my summer body back quickly. had a big woosh this morning. A truly great weigh-in, but I know this is mostly just water weight. still.. seeing progress on the scale after 9 months of being devastated is nice. I had a Doctor's appt today....and a good NSV: all my labs are down, and 2 lbs off of my last Nov visit. My exercise this past week was back up to where I was mostly last summer, so that's another Win. At least I'm heading the right direction: my real goal is to keep my health as I age! Press on everyone! We can do this! Keep tracking! Keeping doing those things that you know are healthy and will work (for me--4 smaller meals, oatmeal for breakfast, focus on veggies and a good portion of them in at least two of the other meals, and finding ways to walk more--getting those steps in), and tracking food intake! Weight for MAY 16th 161, wow I was thinking I only lost .5lbs...I have lost 1.5 lbs. Yea! May 16th weight is 161 down .5 lbs. 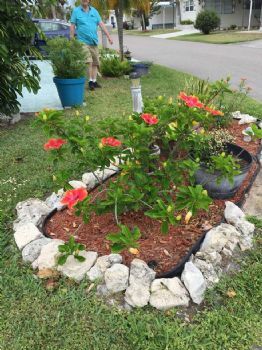 My Hibiscus is blooming nicely. 14 May: 140.4 my one week average since I've been home form vacation. Wow. I have not been in on this challenge since JANUARY. Yikes. I've gained about 8 lbs since last August.. It is pretty difficult, I feel uncomfortable in my clothes and when I look in the mirror. May is always a month in which I finally get myself focused on my long term goals and make changes so being here again regularly is important. I never stopped logging my food. I have been doing it every single day without fail for exactly 715 days! and of course I am still eating healthy foods and exercising every day.. but since I started seeing a therapist and a nutritionist my weight has gone up...slowly.. but still at this point it is noticeable and I feel has gone too far. So, back to eating 1200 cals a day or less, it seems to be the only thing that works for me. Trying to reframe this in my mind.. instead of seeing it as deprivation, I am trying to see it as a positive decision on my behalf to work towards the body I want to live in. So here goes. Weight for 5/09-162.5...have been up and down all week! Trust me--"been there, done that"
THANKS for starting this MA and letting us join. Another goal setter is great. GM All - Up early this morning. I have a miserable cold. I am congested, coughing, feeling of light headedness, sore throat, tired, just plain BLAH. I am drinking lots of water, tea w/honey≤mon, getting lots of rest and sleep. Right now I feel well rested and wished it was a little later in the day, so I could at least be out watering my veggies or working in my garden, but it is still dark. I am looking for 5 this month. To set a goal and make it to the finish is like reaching out and picking a star from heaven. The reward is great! Just found out about this challenge! Did you go outside today??? Did you track your food today?